When my wife (not the unfortunate lass above) and I came home from the beach a couple of days ago, we realized that we were both suffering from a mild case of acute cutaneous solar poisoning. Which is to say, we both had sunburns. 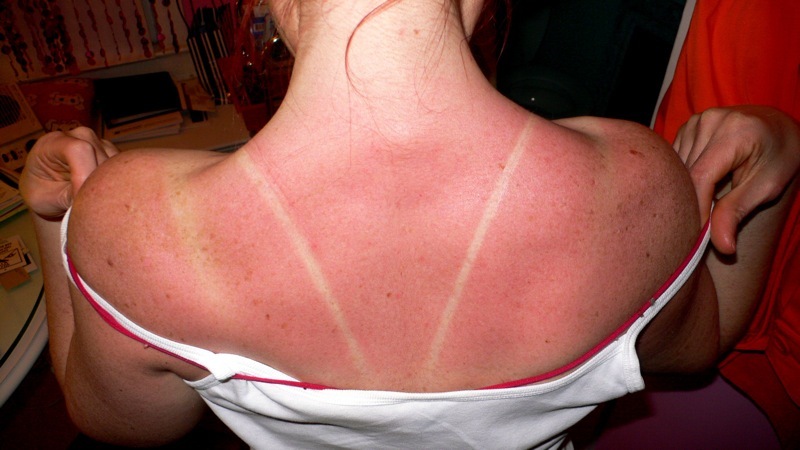 Because that’s what a sunburn is: a form of radiation burn, the result of UV light poisoning our skin cells. In some sense, it’s not unlike burns from heat — heat, after all, is also radiation, but in the form of infrared energy — but the mechanism is very different. Given that we’re in the thick of summer (in the Northern Hemisphere, anyway), I thought it might be a good time to talk about the biology of sunburns. UVA. The most common form of solar UV light at the earth’s surface. It’s always around, it passes through windows, and it penetrates deep into the skin layers. Long term exposure can damage skin, and is now thought to contribute to some forms of cancer. UVA light rays have a frequency between 400 and 315 nanometers (nm). UVB. This is the one that causes sunburns. Most of it gets absorbed by the ozone layer, and it can’t pass through a window. The intensity of UVB at the earth’s surface depends on time of day and the season. It doesn’t penetrate past the skin’s superficial layers, but it does have one benefit: It helps us make vitamin D. UVB rays’ frequencies are between 315 and 280 nm. UVC. Completely filtered by the atmosphere, UV light rays in this band (between 280 and 100 nm) don’t reach the earth’s surface. Companies make sterilizing lightbulbs that emit UVC. I have to stop here for a second and express my admiration for our cells and molecular machinery that runs within them. 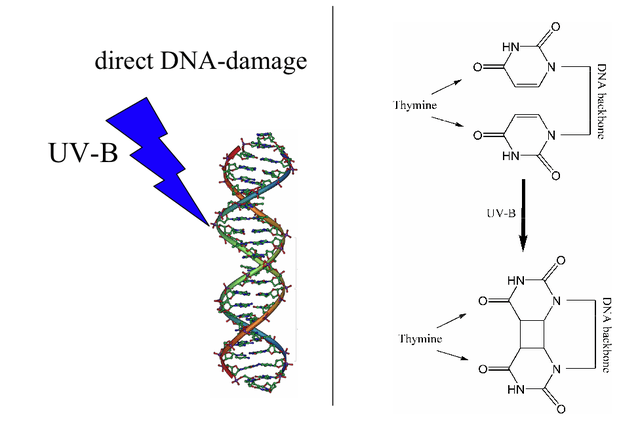 It’s amazing to me from an evolutionary standpoint that our cells can not just detect DNA damage but pinpoint the exact kind of damage caused by UVB exposure and produce pigments to stop just that kind of damage. It’s evidence of exquisitely tuned abilities to sense and respond to damaging environmental factors at a molecular level. And it blows my mind. Apologies for the interruption; back to the science. The damaged cells also try to call in help, producing proteins and other factors that promote inflammation — the body’s way of stopping and repairing most any kind of damage. So all that pain, redness, and swelling you have at a burn? That’s not the burn itself, but the result of your body’s inflammatory response to it. Inflammation triggers pain nerves at the site of the UV damage, telling the brain, “SOMETHING’S WRONG!” Tiny blood vessels called capillaries, which bring oxygen and nutrients to the skin, start to swell, bringing in more blood (which makes the damaged skin redder and warmer) and also immune cells to start repairing what’s been done. Even though it only takes about 15 minutes of UVB exposure to start a sunburn, it can take four to six hours for the inflammation to really kick in, which is why the redness and pain don’t show up immediately. [A] cell that undergoes apoptosis dies neatly, without damaging its neighbors. The cell shrinks and condenses. The cytoskeleton collapses, the nuclear envelope disassembles, and the nuclear DNA breaks up into fragments. Most importantly, the cell surface is altered, displaying properties that cause the dying cell to be rapidly phagocytosed [eaten], either by a neighboring cell or by a macrophage…before any leakage of its contents occurs. This not only avoids the damaging consequences of cell necrosis but also allows the organic components of the dead cell to be recycled by the cell that ingests it. 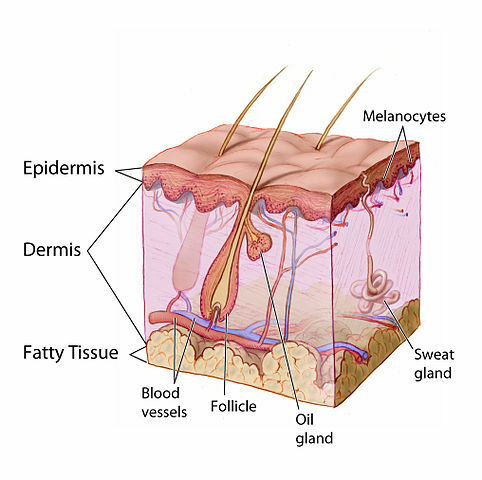 The end result of apoptosis may not look so neat and tidy to us though…as the damaged skin cells die, they start to peel away from underlying skin layers, which is why your skin peels after a burn. Luckily, we have a way of stopping this UVB-driven molecular madness: sunscreen! Now, I had thought to go into the chemistry of sunscreen here, but as I’ve been reading I’ve come to realize that I’ve barely scratched the surface, and could write a whole separate post on that topic. So stay tuned for next week’s post. UPDATE: Turns out I wasn’t the only one thinking about sunburn today. LiveScience.com also posted an article on sunburn as part of their Science of Summer series. Check it out!. Did have one more question or, if you will, can you please clarify and confirm that yes, people with darker skin tones can and do develop sunburn? And, if you’re able, explain why those in very sun exposed areas (Africa, South America) may not develop sunburn as often. I’m pretty sure this is because they use natural sunscreen protectors, but would love to hear more. Excellent point! I’m going to post something about sunscreen next week, and I can touch on melanin as “nature’s sunscreen” and the fact that it’s doesn’t completely block UV light, even for people with darker skin tones. Wow! Very interesting! This helped me with a homeostasis project I’m working on. So thanks!